In the last month, I have made these 3 times. I think I have mastered and memorized the recipe. These are so so good and really make a great dessert to take to any BBQ or pot luck. I will be taking them for the cookie reception after my daughter’s Kindergarten graduation. Preheat oven to 350 degrees. Line 9X13 pan with foil and spray with cooking spray. In a medium bowl, stir together flour, salt, and baking powder. Set aside. In another medium mixing bowl, beat together sugars and butter until light and fluffy with electric mixer. Add in eggs and vanilla and mix well. 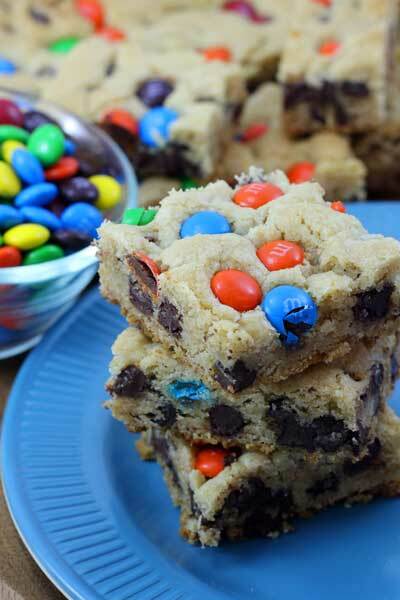 Fold in M&Ms, chocolate, and butterscotch chips. Spoon in to greased pan and pat down. It is a thick batter so it won't pour or spread too much. Cool completely before cutting in to bars.